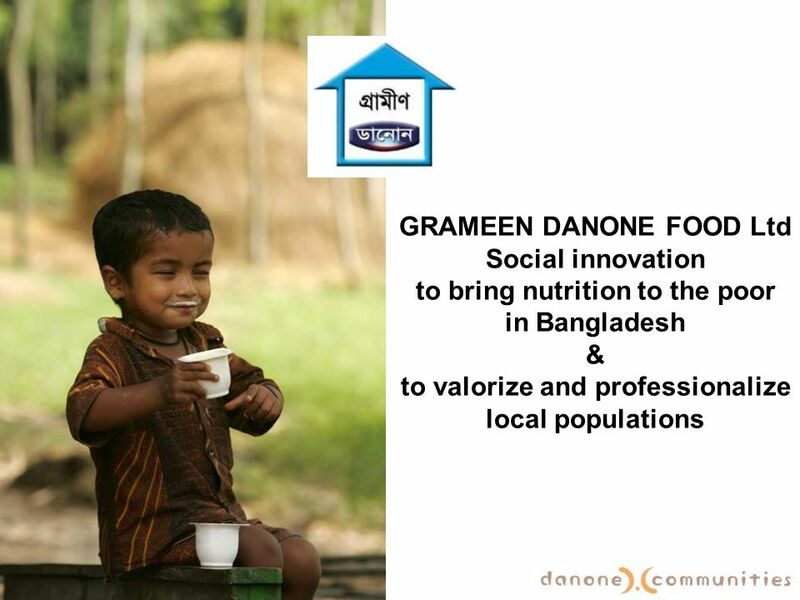 GRAMEEN DANONE FOOD Ltd Social innovation to bring nutrition to the poor in Bangladesh & to valorize and professionalize local populations. 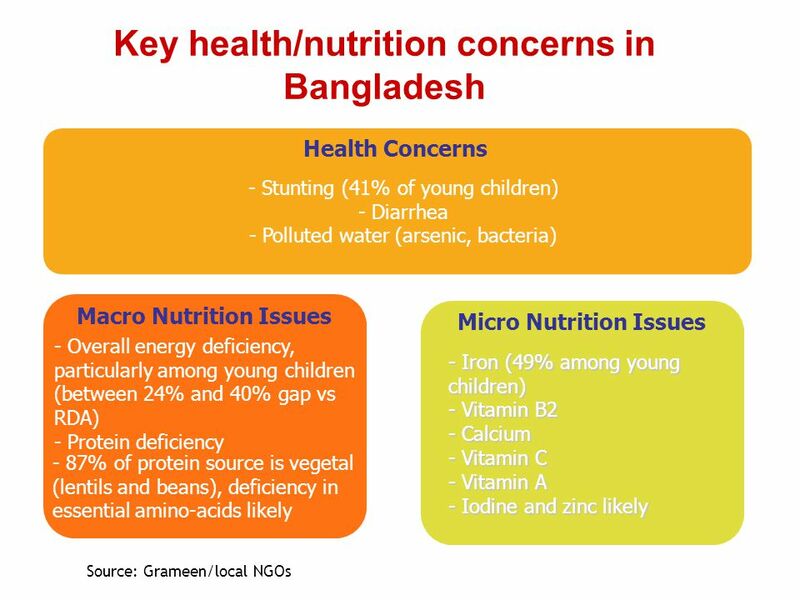 This model relies on a yoghurt called Shokti Doi, specifically designed to bring health at affordable price to poor populations in Bangladesh. Each cup of ShoktiDoi brings (~ 12.5% of RDA in) Calcium and is fortified with 30% of RDA in Zinc, Iron, Vitamin A and Iodine, micronutrients which local population lacks. Each cup is sold at 6tk per cup, ie around 6 cents of Euros, only. Today we sell about cups / month. This yoghourt is made in a simplified micro- factory that is 100 times smaller than a normal dairy factory. Yearly capacity of this micro plant is 3000 Tons. This factory is settled in Bogra, 250 km north from Dacca. 50 employees from local villages. It has been designed in an environmental way (collecting rain water, partially working with solar energy) Simplified equipment to use manpower but still same quality standards as Danone Run by Bangladeshi Autonomous but networked, to be able to replicate to 50 factories Using milk of 60 local farmers. Milk is bought from local supply. 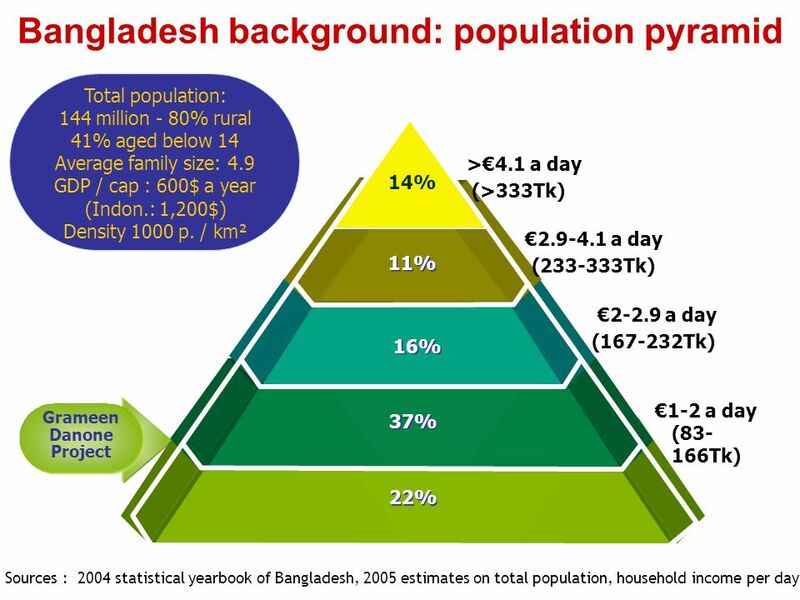 Average Bangladeshi farmer has 2 cows producing 2Liters / day (compared to 40 Liters / day in Europe). Factory helps improve productivity of cows and improve quality of milk, buys the milk at good price and helps increase income of these farmers. Number of farmers : 60. Product is delivered in 30 to 50 km radius around factory, through ecological vehicles, mainly rickshaw vans. Distribution is through small urban shops but also through sales ladies. 30 ladies today. (Sales ladies network has reached 300 ladies.) This women have one day credit on the sales, reimburse products and get an income from the margin. 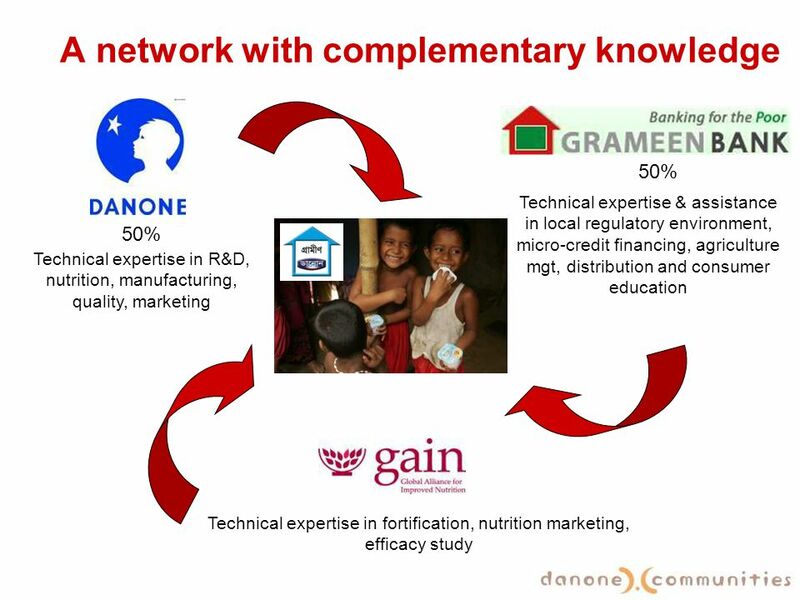 They are often Grameen borrowers. 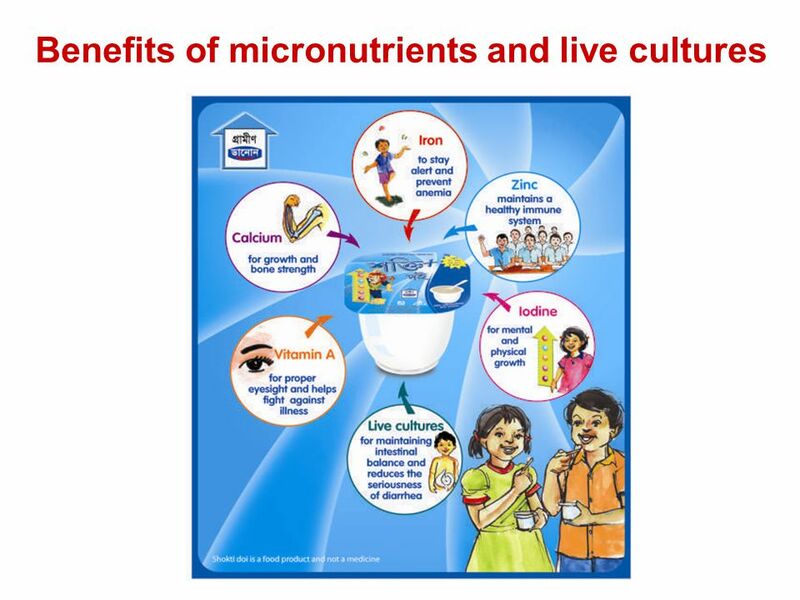 ShoktiDoi has been specifically developed by Danone’s experts in R&D, with technical help of GAIN, to fulfil the nutritional needs of children in Bangladesh and to contribute to their healthy growth by bringing them the benefits of milk, live cultures and other micronutrients they lack. 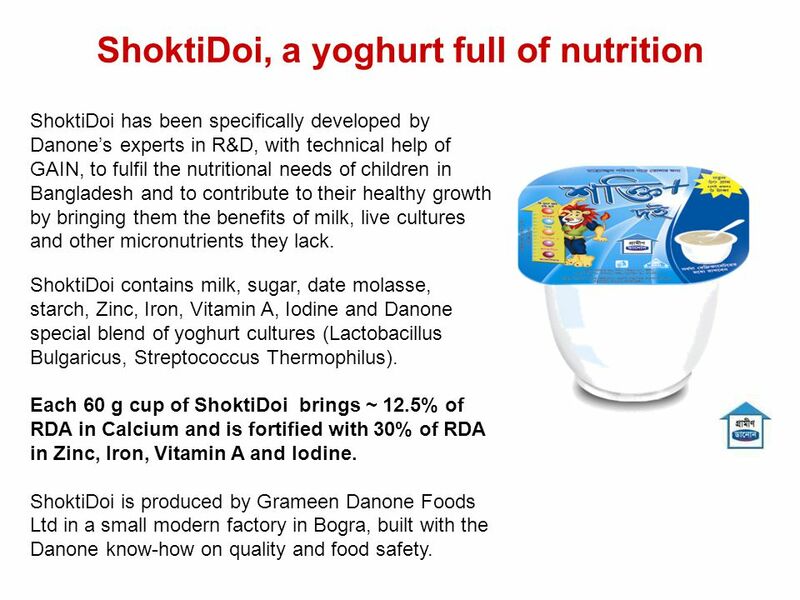 ShoktiDoi contains milk, sugar, date molasse, starch, Zinc, Iron, Vitamin A, Iodine and Danone special blend of yoghurt cultures (Lactobacillus Bulgaricus, Streptococcus Thermophilus). 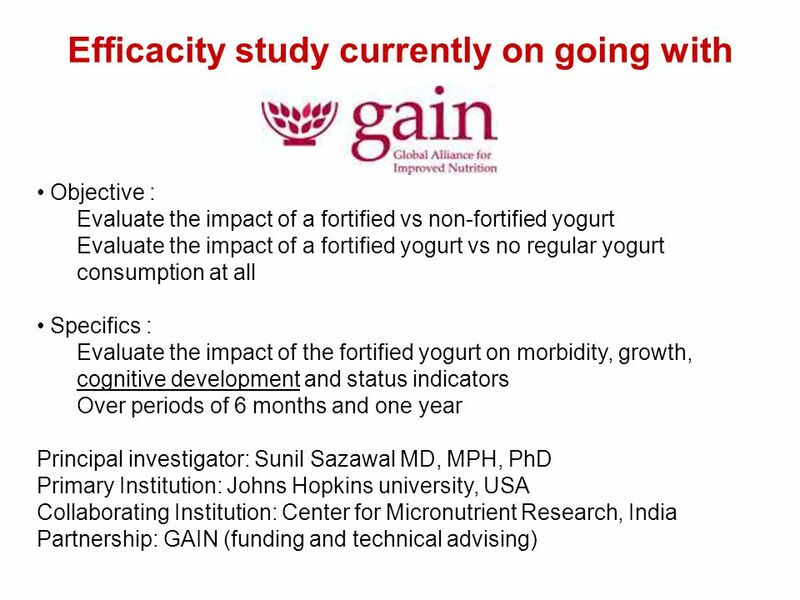 Each 60 g cup of ShoktiDoi brings ~ 12.5% of RDA in Calcium and is fortified with 30% of RDA in Zinc, Iron, Vitamin A and Iodine. 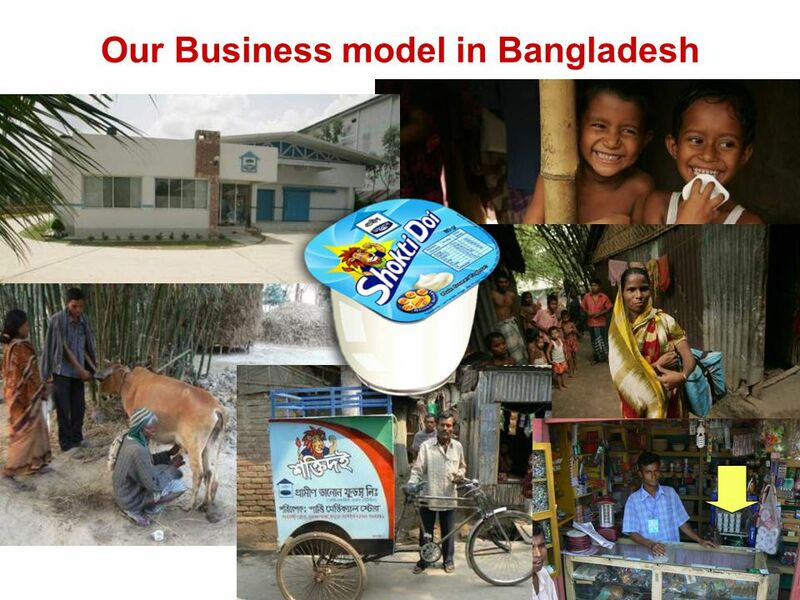 ShoktiDoi is produced by Grameen Danone Foods Ltd in a small modern factory in Bogra, built with the Danone know-how on quality and food safety. Sales’ladies Autonomous factory danone.communities network Impactful volunteers Sales’ ladies in continuity of the Grameen borrowers Empowered and professionalized Overcome social barriers How a factory reaches its autonomy Guy Gavelle alone first, a doer and a teacher with 30 years of experience A Bangladeshi plant manager (Probir) & a local team Operational autonomy in 3 months Simplified esay-to-operate (and maintain) factory some technicians left the company because they now have valuable skills Networked and therefore able to overcome big challenge - ex : reformulation through R&D from Danone in India Impactful volunteers : young people coming for one year, ex : Rémi Bring competencies & better use of technologies A connecting point with the Danone network, and broader through d.c blog Tomorrow Probir should be autonomous to access the network via virtual share of experience on danone.communities.com danone.communities : create a network able to bring nutrition & alleviate poverty, in which each one founds a way to optimize its work. Aim is to empower and to make local populations develop themselves. 1/ Build a network of complementary knowledge 2/ Experience to educate Thank you for your support! 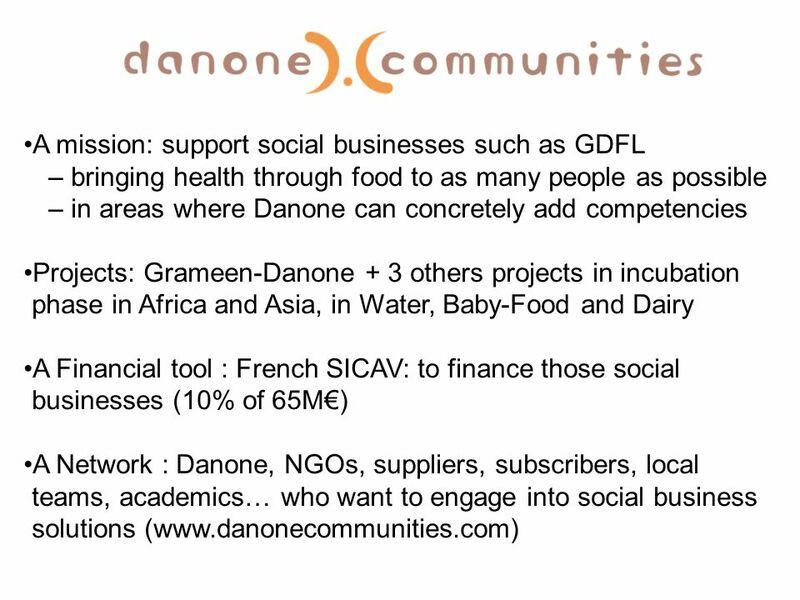 Download ppt "GRAMEEN DANONE FOOD Ltd Social innovation to bring nutrition to the poor in Bangladesh & to valorize and professionalize local populations." By MUKAMWIZA Honoree, Bsc FST Managing Director Local Cheese Promotion Ltd. Contribution of Aquaculture to Food Security Globally Modadugu V Gupta. Energy Technologies for the Poor Technology for poverty alleviation: Relevance and Prospects in South Asia October 10-11, 2003 British Council, New Delhi. FOOD FORTIFICATION IN UGANDA Dr. Elizabeth Madraa MDMPH. Income Poverty and Hunger in Asia: The Role of Information S. Chatterjee, B. Prakash and S. Tabor. Hunger and Malnutrition George Norton Agricultural and Applied Economics, Virginia Tech Copyright 2009 International Agricultural Development and Trade. MDG 1 and Disability Poverty reduction and eradication of hunger. The Physical Side of Hunger Concepts & Measurements. The impact of financial and economic crisis on the family and child in the Republic of Moldova and suggested policy responses November 10 th, 2009. Food Voucher Project June 2002 Promoted by: Womens Development Business Investment Holdings Disability Employment Concerns Trust Accor S.A.
Social Business Lecture # 18 Week 11. 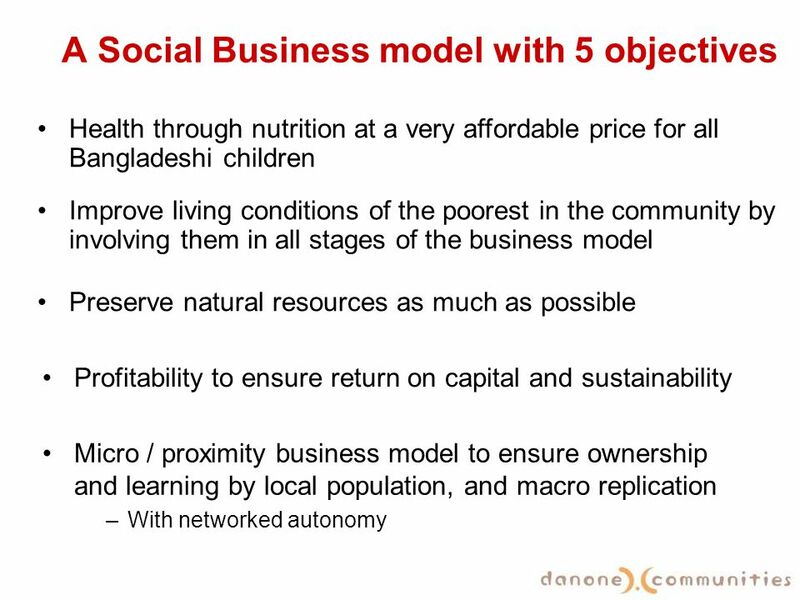 Structure of this class What is social entrepreneurship Link with microfinance Case study : Danone Yunus’ idea more. 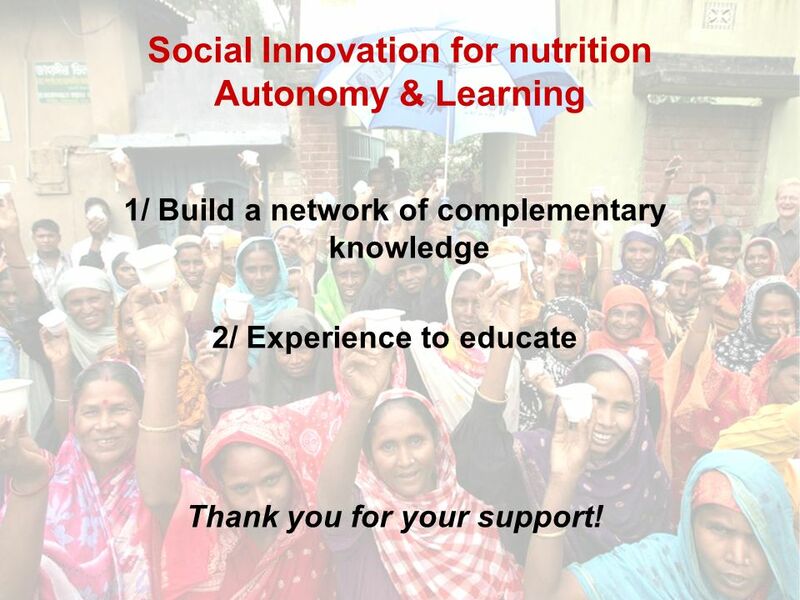 Defining and Measuring the Social Impact of Clean Cooking Solutions March 16, 2015. Current recommendations and advice: Promoting a healthy diet during pregnancy and the early years Dr Helen Crawley March 2016.